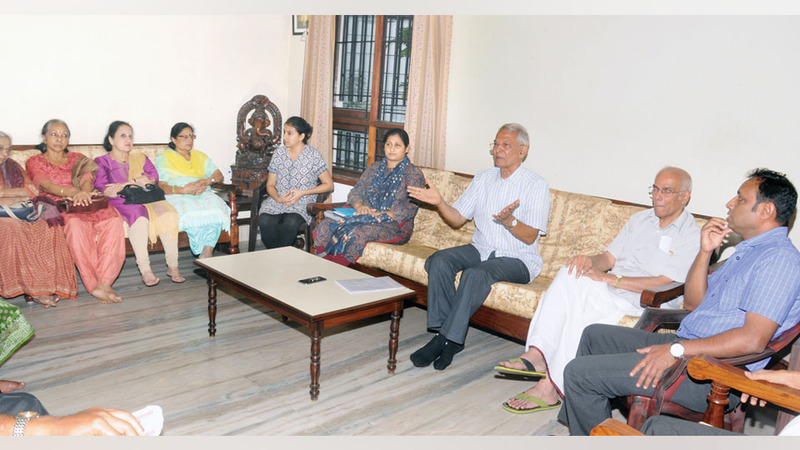 Mysuru: The second meeting “Responsibility of common people in democracy” to promote active participation by the educated and professionals in the electoral process was held at the office of Mysore Grahakara Parishat (MGP) in Yadavagiri here last evening. The meeting gains significance as the election to the Mysuru City Corporation (MCC) is scheduled to be held in September this year. The meeting was attended by activists, professionals, industrialists and retired government officials. The meeting resolved to elect at least two educated and professional candidates in the election. At the outset, Ashvini Ranjan of Pratham Mysore said that winning the MCC election was just a matter of securing 2,500 votes. “We need to convince the educated and professional class to stand for election. Only if youths and the educated participate in the electoral process can there be a social change,” he said, calling upon the educated to do their part to the society. He discussed how a new vote bank of educated and professionals can be created to make a difference if they start taking active role in democratic process. Such a vote bank can be far more effective than the present vote banks based on caste, religion, community, etc. he opined. Dr. Bhamy V. Shenoy discussed the unscientific restructuring of 65 Wards and how the whole process of critical importance was completed without involving the public. Though the mandatory press notifications were issued to meet legal requirements, public involvement was minimal, he said. “Reservations of wards based on caste and carving of wards with unequal number of voters (some having less than 10,000 while others having more than 30,000) was done with the hidden agenda of favouring some potential candidates or political parties,” he said. P.M. Bhat argued that there were over 7 Wards where winning margin was less than 3,000 votes and if only informed and educated voters participated, results could have been different. Dr. Renu Agarwal suggested introduction of e-voting like in foreign countries where people can vote from their homes and offices. Most of the participants stressed that unless citizens are educated on the sacred duty as citizens to vote, no initiative will succeed. The counter argument was that people have lost faith in election and unless they see light at the end of the tunnel, their confidence in electoral process cannot be restored. There was discussion on some successful examples of getting voters to participate in large numbers. R, Vasudev Bhat, Secretary of Vijaya Vittala Educational Institutions, explained how his college, through the students, motivated their parents to vote rather than staying at home on the voting day. Raghupathi Thamankar gave details of how he encouraged over 150 flat dwellers in his apartment complex to vote. Though in the beginning there were some apprehensions expressed about the success of such initiatives, in the end it was resolved that if momentum can be maintained, this movement will succeed. It was decided to form a core group led by Ashvini Ranjan to develop an action plan to get at least two candidates from educated class to contest the elections and get them elected. MGP members R. Chandraprakash, S. Sathyanarayana, M. Janakiraman, U.B. Acharya, Malavika Gubbivani of Aam Aadmi Party and others attended the meeting.